In early October 2012, I was in Kansai to attend a friend’s wedding. It was not my first, nor my second time in Kansai, so I took the time to research and find something interesting and new. I learned that INAC Kobe was playing on the weekend that I was going to Kansai and I had a free day that day. I decided to go to my very first Nadeshiko game. Nadeshiko, “pink” in Japanese, is the nickname given to women’s football in Japan. It is often confused with Nadeshiko Japan which is the nickname for the women’s national team. The Nadeshiko League is the equivalent to the J-league for men but unfortunately it isn’t a professional league in itself. The Nadeshiko League has seen a huge jump in attendance for their league since the women’s national team won the Women’s World Cup in 2011 and Honmare Sawa won the Ballon d’Or, or rather the Golden Ball, the highest award possible in women’s football. The Nadeshiko League is still small in comparison to the J League and it will take time for the league to grow even further. The Nadeshiko League was formed in 1989. Its official name is the L League, or Ladies League and similar to the J League in that there are separate divisions. The top league, L1, is called the Nadeshiko League and the junior league, L2 is called the Challenge League. Many of the J League teams are affiliated with their own Nadeshiko League teams and some even have the same names, but the similarities end there. The Nadeshiko League has their own set of strong teams that aren’t always associated with their J League counterparts. The league is comprised of 10 teams in L1 and 12 in L2. The same promotion and relegation system exists in the L League but I am unsure whether or not only one team or more are promoted and relegated at the same time. The difference in skill between the teams in the Nadeshiko League itself is a bit astonishing. Unlike the J League where the teams are fairly evenly matched, the Nadeshiko League can be very one sided. The strongest team this year is INAC Kobe. They have several members who are also on the women’s national team. They have a commanding lead in the season and they are favourites to win the championship. The second place team in the league is a full 20 points behind INAC Kobe as of the writing of this post. The second place team NTV Beleza is still a strong team with a few players making the national team and they are also in a strong position to keep second. From there, all of the teams start to trail off with the last place team, Fukuoka nearly 80 points behind INAC Kobe. It will take time for the other women in the league to gain the experience and talent and may take a generation or two but I do feel that with the current surge in popularity for women’s football in Japan that this will happen. INAC Kobe is teamed with Kobe Vissel. 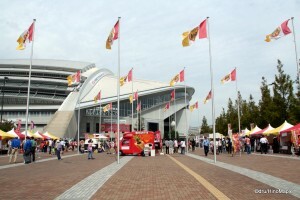 The association with Vissel means that the club shares the same stadium as well as team colours. The uniforms are different and the level of play within each club is also different. It is interesting to see how a bit of money can help a team propel itself to the top of the league. Kobe Vissel is a small club by J League standards. Their stadium is not small but it isn’t large either. When I went to the INAC Kobe game, the game wasn’t sold out and large areas of the small stadium were closed off. There were several thousand people there, a lot more than I expected. It was a nice quiet game and you could hear the girls screaming orders at each other. The crowd was full of families more than fans. They did enjoy the game but the majority of people that I saw had children with them. It is a relatively cheap way to enjoy an afternoon with your family and definitely cheaper than going to a J League game. The cheering was not as boisterous as a J League, or even a baseball game for that matter. It was loud enough to get you going but the cheering section was pretty small compared to other games that I have attended. INAC Kobe had a decent showing for those with drums and when compared to the JEF Chiba team who had about 20 people in their section, it was more than enough. Perhaps it was the fact that there were more people in the INAC Kobe side that muffled the sounds a bit but the JEF Chiba team had louder drums and they were more effective compared to the INAC Kobe cheering section. It would be interesting to visit an INAC Kobe game in Tokyo someday. The game itself was a slaughterhouse. Within the first 2 minutes, INAC Kobe went up 1-0 with a goal from Megumi Takase. JEF Chiba took the wind out of their sales with a goal off a corner kick at 6 minutes in but INAC Kobe was still attacking. Their play was very strong in the first half with a total of 5 goals. Needless to say, a 5-1 lead for INAC Kobe was a significant lead. I thought they might continue to blow them out, and at the start of the second half I was starting to think twice as INAC Kobe was starting to show their faults. The second half of the game started with a quick goal by JEF Chiba at the 46 minute mark. It was a bit of a stunner and a very good goal that was not countered by INAC Kobe. INAC Kobe looked a little weak for most of the second half but came to life again at the very end with a couple goals by both Takase and Shinobu Ohno, the team’s captain. The game had two stars, Ohno and Takase. Takase was an obvious choice as she had a hat trick. I was a little surprised that Ohno was given the player of the game award but I didn’t get a great view of the entire game. I had great seats near the pitch which made my view of the proceedings a little difficult to see due to the angles. Being higher up affords greater views but it also means you can’t see the players as close. The great thing about Home’s Stadium, INAC Kobe’s stadium, is that you are so close to the pitch that you can really see the players up close. Unlike other stadiums where I have been a fair distance away, Home’s Stadium is a really nice stadium. Going to a Nadeshiko League game is a lot of fun but not as much fun as going to a J League game. Having someone to go with you is also a help. It was my first time to attend a game of any sort alone. It was still great to go but it would have been a lot better if I had a chance to go with a friend or two. Hopefully in the next few years I’ll get an opportunity to go again and this time I will be able to go with a friend. Going to a Kobe game will be great too. I did one little faux pas when I was there. I was wearing a nice bright yellow t-shirt. I knew they were playing JEF Chiba but I thought JEF Chiba mainly wore green. They also proudly wore yellow which meant I was wearing the wrong colours! It was important for me to buy something red so that I wouldn’t look as if I was supporting the wrong team. I made was sure to buy an INAC Kobe scarf, one supporting Sawa, and proudly wore it all day during the game. I may not use it again but I will definitely remember the game a lot more now that I have that souvenir. This entry was posted in Football (Soccer) and tagged Ballon, Ballon d'Or, Challenge League, d'Or, Football, Golden Ball, Home's Stadium, Honmare, Honmare Sawa, INAC, INAC Kobe, INAC Kobe Leonessa, INAC Leonessa, J-league, japan, JEF, JEF Chiba, JEF United, JEF United Chiba, kansai, Kobe, Kobe Vissel, L League, L1, L2, Ladies League, Leonessa, Megumi, Megumi Takase, Nadeshiko, Nadeshiko Japan, Nadeshiko League, NTV Beleza, Ohno, Ono, pink, Pink Japan, Pink League, Sawa, Shinobu, Shinobu Ohno, Shinobu Ono, Soccer, Takase, Women, Women's Football, Women's Soccer by Dru. Bookmark the permalink. Actually, jokes aside, I wonder if there *is* women’s rugby in Japan? Even in the butch ^^ Western world it’s not very common. I guess there is a women’s rugby, but it would be very small. Company league or even smaller… Then again, rugby isn’t even popular in N. America. One of my past co-workers did play rugby though.